U.S.A.: Nicolas-Hays, Inc., 1976. 465 pages, Index. Book is clean inside & out but for name written on reverse of front cover, vrey light edge & corner wear. Book is a philosophical journey through Greek philosophy, Contemporary Philosophy and the Bhagavad Gita. 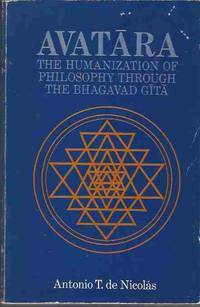 New (at the time) translation with critical notes on the Bhagavad Gita. . Oversized Soft Cover. Very Good. Used. Avata?ra, the humanization of philosophy through the Bhagavad Gi?ta? : A philosophical journey through Greek philosophy, contemporary philosophy, and ... with critical notes of the Bhagavad Gi?ta? N. Hays. PAPERBACK. 089254001X Fast handling - Orders prepared for Shipping Next Business Day! . Good. Avatara: The Humanization of Philosophy Through the Bhagavad Gita. New York: Nicolas Hays, (1976).. Paperback. From the library of philosopher John Koller with his name in ink, few pages with pencil notations, sheet of tablet paper laid in with a short paragraph of analysis, else Very Good. . Very Good. Paperback. 1976. Nicolas Hays, 1976. 465pp. Blue cloth hardback, spine slightly faded, no DJ, c.10pp short pencil lines in margins, index, Philosophical journey through Greek Philosophy, contemporary philosophy the Bhagavad Gita on Ortego y Gasset's intercultural theme : Man and Circumstance, . Hard Cover. Very Good/No Jacket. N. Hays, 1976. Paperback. Good. Nicolas-Hays. PAPERBACK. 089254001X 1976 Nicolas Hayes LTD paperback - inscribed and signed by author - some wear to cover - single crease on binding - some staining to page edge - otherwise binding strong contents clean - enjoy . Good. Nicolas-Hays. Very Good. 1982. Paperback. 089254001X . Stiff card wrappers, a reading crease to spine, ownership name stamped inside front cover, pages unmarked, binding tight. ; 8.9 X 5.8 X 1.4 inches; 466 pages . Avatara: The Humanization of Philosophy Through the Bhagavad Gita. A Philosophical Journey Through Greek Philosophy, Contemporary Philosophy, the Bhagavad Gita on Ortega y Gasset's Intercultural Theme: Man and Circumstance. N.Y.: Nicolas Hays, 1976. Cloth. First Edition. 8vo - over 7¾" - 9¾" tall. 465p. A very good copy, the lettering on the front cover of which is a little rubbed, no d.j.. First Edition. Hardcover. Very Good/No DJ. 8vo - over 7¾" - 9¾" tall.